Major snack attack, you guys. You need a snack, which one should you choose? What's the correct answer? None of those options sound that great do they? The answer is actually secret option E) None of the above. What's wrong with raw almonds? Nothing really...that is, if you actually enjoy eating raw almonds. They're healthy, which is great, but not exactly satisfying, so it's all too easy to grab more than you need and before you know it, your snack has turned into a mini meal. And chips? Pretty self explanatory. Chips are delicious in the moment but they're not exactly rich in nutrients, likely leaving you still hungry and even more lethargic than you felt pre-snack. What about carrots? Similar to raw almonds, carrots are healthy but not very satisfying both in the flavor and fullness departments, leaving you hungry and still on the prowl for something delicious. Waiting for dinner is also not a great option when you're really starving since you'll likely feel grouchy all afternoon and set yourself up to overeat when you do sit down for dinner. Which brings me to the correct answer: E) None of the above. Because what you really need is a snack that's delicious, satisfying and healthy; we'll throw in easy to grab-and-go for extra points. 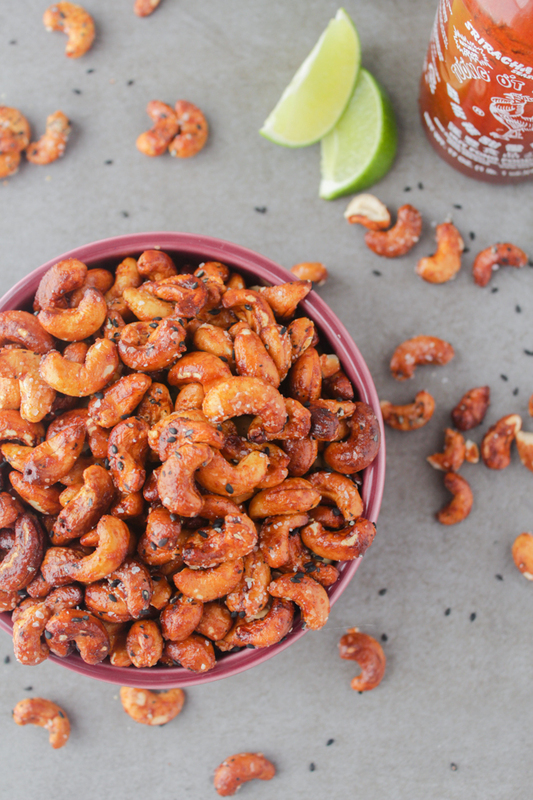 These Sesame Sriracha Cashews hit all the marks. They're full of protein and healthy fats, which hold you over until dinner, and are so deliciously crunchy, sweet and salty, you'll be completely satisfied with just a small handful. They're also super simple to make, require only five ingredients, and store well in a zip lock bag so you can make a big batch and enjoy them throughout the week. Snack attack crisis averted. 1. Preheat oven to 350 degrees. If using raw honey, melt it in the microwave for about 20 seconds until it's liquid. Combine Sriracha, honey and juice of the lime in a large bowl. 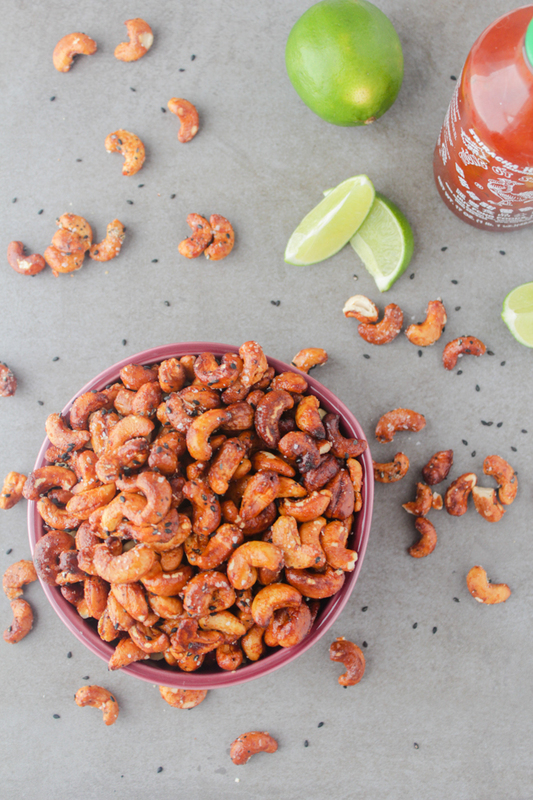 Add cashews and toss to coat. 2. 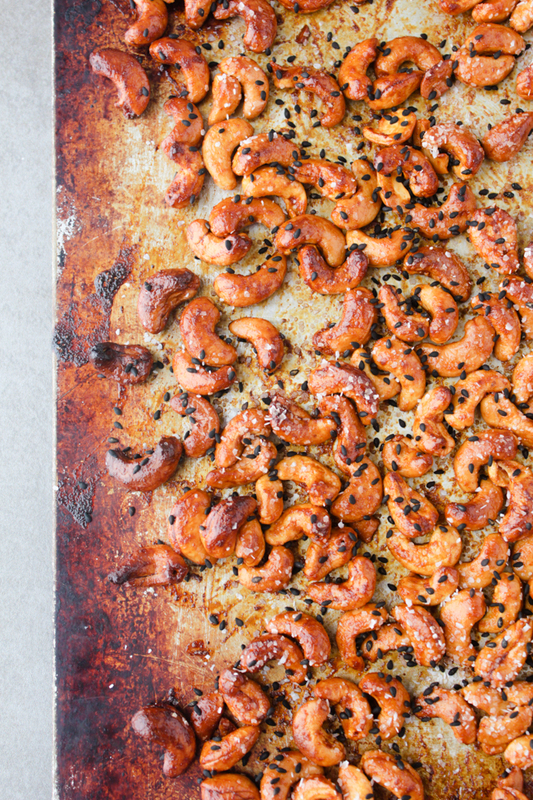 Spread the cashews in an even layer on a large baking sheet. You will have excess sauce left over in the bowl, do not throw away but just set to the side. Bake in the oven for about 10 minutes. 3. 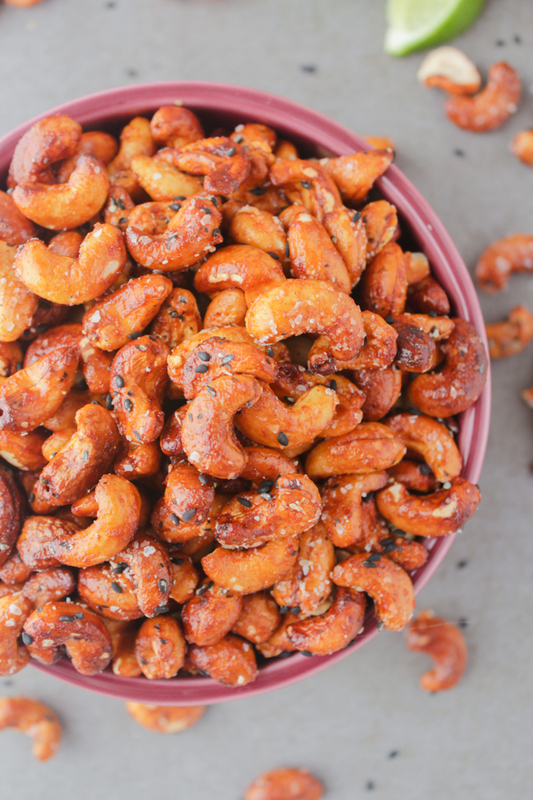 Remove the cashews from the oven and pour them back into the bowl with the remaining sauce. Stir to coat before spreading the cashews back onto the baking sheet. Sprinkle with sea salt and sesame seeds and return to the oven for about 10 minutes. 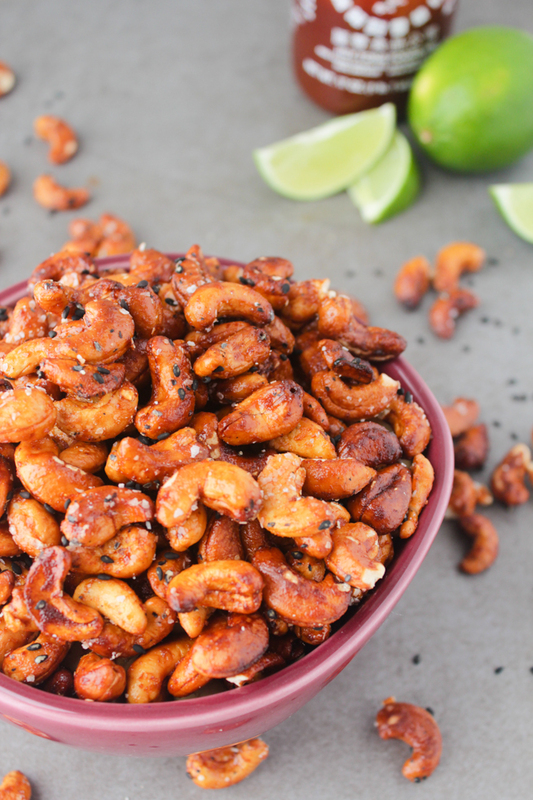 Spread the cashews out onto a a large sheet of parchment paper to cool completely before serving. This is perfect timing- I just scored many (many) bags of almonds on sale, and have been wondering what to do with them all! Sometimes you need to spice them up a bit! Thanks! Never tried something like this but looks GOOD :) YUM! Thanks! They are seriously so good! Oh my does this look delicious and so simple to make! Yay!! I would love to hear how you liked them! So true!! This snack definitely feels more indulgent than it is. Thanks for stopping by! Hello dear, now thats a type of snack that I would totally go for! Me as a HUGE cashews nuts fan love this idea. Actually I am craving them right now, not sure if that's good, lol! Thanks for this great recipe! Have an awesome week, lotsa love! I'm a huge cashew fan as well! They're so versatile and fun to play around with in different ways. This recipe is one of my favorite ways to eat them though - hope you love it! Wow! This sounds like such a delicious combination. Thanks, Eryn! They really are so good! 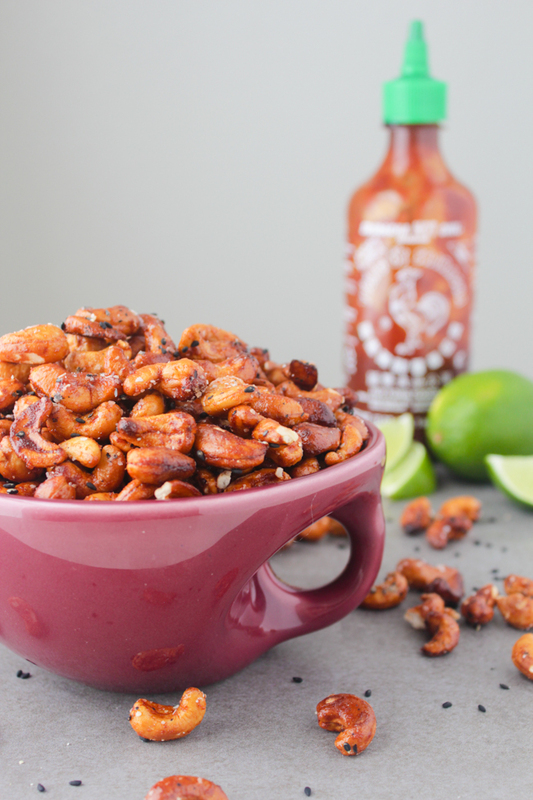 I love sriracha and I love nuts, this sounds soo good! 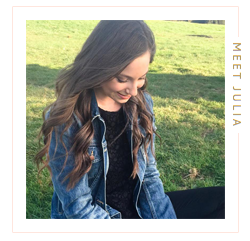 I really love the photos, I really want to try this! What a fun idea! I never thought of giving flavors to cashews! These. Look. DELISH. Going back to your initial multiple choice question, my answer would typically be all of the above. But with these spicy little guys around, I think the answer would change! I've gotta give 'em a try!